I'm heading down to see Tim at Boardwalk Chevrolet this morning. I've decided to trade in my '17 Blade Silver Grand Sport for a identical Z06/Z07. As much as I want this Z, the hit on the GS is a hard pill to swallow. I can keep the GS and continue to want a Z06, or I can drive home today with a huge smile on my face. You will never regret it!! The Z06/Z07 Is the beast. I haven't told anybody, most would think I'm nuts. At the end of the day, you work too hard to settle at this stage. We are not talking about getting pepperoni instead of a combo pizza here. I learned a long time ago that settling really tarnishes ownership. And believe me I have done a lot of that! I can go back to my 93 Probe GT when I wanted a 93 Z28. Couldn't find one. Probe was a really nice car...but not what I wanted. 97 Maxima when I wanted a 98 Audi A4...remember how nice those looked? Maxima was great...not what I wanted. 99 Mustang GT...what I wanted and loved it! 02 Volvo S60 T5...wanted a BMW 330i...great car and happy with it...not what I wanted. 05 Mustang GT, what I wanted and loved it! You can see the pattern here, I can go on and on, but you get what you want and you will enjoy that much more. DO IT! Have you actually driven a Z06 yet? It might be something to do before dumping the GS. Although I haven't driven the GS, my guess is with its Z06 chassis it drives similarly. HOWEVER, the Z can't really utilize all of the power of the LT4 in a street situation. It's too easy to see much of it end up as tire smoke. Of course, YMMV...but you really should drive one first. I learned a long time ago that settling really tarnishes ownership. And believe me I have done a lot of that! It started with marriage and I still haven't woken up from that nightmare. it is what it is it's only money and you'll make more of it or find it or you will just sustain life anyway life is too short to settle especially later in life. 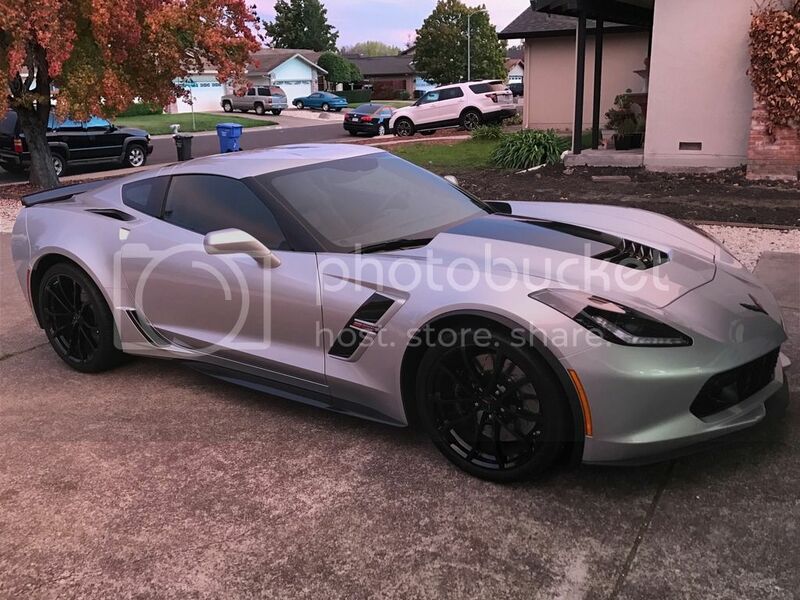 I waited until I was 42 years old (kids driving already and financially able to swing it) to purchase my first new Corvette which is the Z06 I currently own. my journey for a new Corvette started out with just getting into the C7 somehow selling my C6 and having minimal impact on other things we like to do. That all changed when I went to Corvettes at Carlisle this year, my first time. I rented a Mustang convertible and yes I tried to find a Camaro but none were available last minute as I didn't feel like bringing my C6 to an event where I knew the latest and greatest would dominate the area. I'm glad I did because it just made me want a C7 even more I met with Mike Furman there delivering a c7z with the Callaway package to a very happy repeat customer. when I finally started looking I was going to settle for a C7 then my good friend pointed something out thank god. He said you better think about that because you'll put a ton of money into that C7 to make it as fast as a ZO6 and it won't be and won't look like it either. then I thought about a Grand Sport, putting a supercharger on it and by the time I figured all that out how could I not buy leftover 16 Z06? I even went a step further. I was going to buy a 1LZ. but stepped up to a 3LZ. and not a bare bones one either lol. Couldn't be happier. you won't regret it. you made a mistake and you're going to rectify it just call it the cost of doing business and enjoy every minute of it and never regret it because you will always regret that grandsport whenever you're in the same parking lot or road or show as the ZO6 you really wanted. Good luck with your upgrade. Glad you're getting what you want and someone very shortly will be getting a very nice, lightly used Grand Sport. That will be a depreciation smack down. Good luck! Make sure you seriously want the Z06 power....It's crazy fast and scary at times...I myself was going to get a GS and got the Z instead and have zero regrets. That's a nice GS, but don't settle again. Get exactly what you want with no exceptions. Just throw on a PD blower and you will have the power of the Z! I daily drive my Z06 and I use all 650HP often. Maybe it is the aggressive drivers in Tampa but it is not uncommon to apply max HP to get were I need to go. In Sport mine just hooks up and goes. Only a fool turns off the nannies on the street. With them on the only real danger is you get to "Go to Jail" speeds in a hurry. My Gen 5 ZL1 it was common for me to see 100+ mph sprints..... this car it becomes 125+ without much effort. I drive my Z06 daily and the power level becomes normal. When I drive my wife's SUV, I nearly get creamed due to expecting 470 hp more than that POS has on tap. I really stretched to get my Z. Traded a 2015 Z/28 to get it and couldn't be happier. The Z/28 got old/normal pretty quick but I already have more miles on the Z06 and I still look forward to driving it. Love this car. Do it. I can't imagine driving this car being down 190 HP and 185 ft-lbs. Yup....and without a warranty too. I daily drive my Z06 and I use all 650HP often. Maybe it is the aggressive drivers in Tampa but it is not uncommon to apply max HP to get were I need to go. Please elaborate with the details.